The text of my Chair’s report for February 2017. The year has started off to a somewhat hectic pace. The first matter that arose just before Christmas was the completion of latest monitoring report concerning the presence of Kauri dieback. The news is not good. The heritage area now has the unfortunate characteristic of being the most infected area in the country. By comparison, on Great Barrier Island, where the disease has been present for decades, the spread appears to be more limited. This may be due to a lower population and a drier climate. The rate of infection in discrete areas has increased from 7.9% 5 years ago to 19%. And the highest risk vector has been identified as soil disturbance associated with human activity. The report also noted that the use of trigene cleaning stations is declining even though knowledge of the importance of cleaning is high. I am not surprised that the increase of infected areas has occurred at the same time that trigene use has reduced. 83% of people trekking through the Waitakeres are ignoring the hygiene requirements. Kauri protection zones are not working as intended. Track counts show that even tracks that have been closed are experiencing foot traffic despite their status. Sandra Coney and I urgently met with the Mayor and Councillors Penny Hulse and Linda Cooper and others just before the release of the findings from the report. I am pleased that everyone accepts the importance of dealing with Kauri dieback and more resources are being put into education and prevention as an urgent priority. The news is not all bad. The experiment with Phosphite treatment has shown good results and recently an enhanced trial, Kauri Rescue was announced. The proposal is to engage with local land owners to treat diseased trees with Phosphite and to monitor the result. 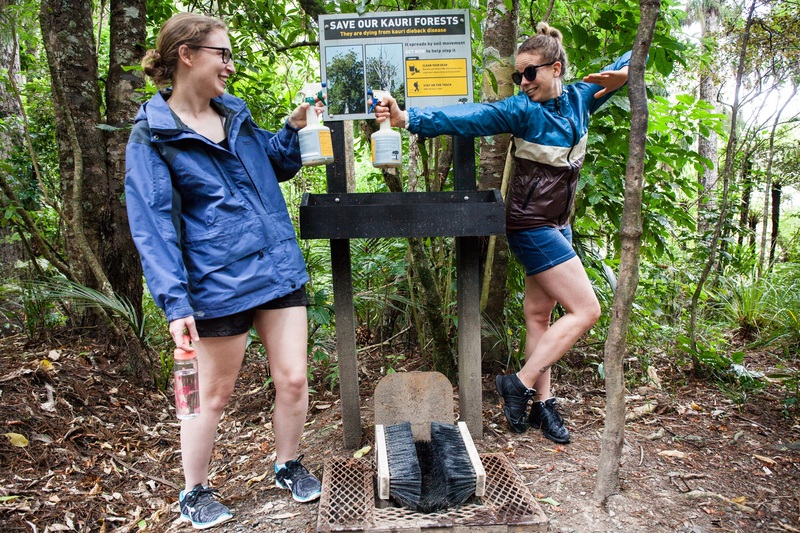 “This exciting new project Kauri RescueTM otherwise known as Community Control of Kauri Dieback: Tiaki Kauri seeks to engage the public in refining a new citizen science tool for the treatment of Kauri Dieback Disease, which is decimating kauri forests in northern New Zealand. The project team comprises of scientists, social scientists, iwi and community groups and is funded for two-years from the Government’s Biological Heritage National Science Challenge. The team will recruit private landowners to work alongside scientists to treat their own trees with a chemical called Phosphite which has shown great promise in Kauri Dieback Programme-funded scientific trials, by enabling kauri to fight back against the Phytophthora agathidicida pathogen that causes the disease. The initial pilot study will involve a small number of private landowners to test and refine the methodology before expanding this to a larger group in the second stage of the project. If you live in Titirangi and have diseased trees on your property you may wish to consider taking part in the trial. The developments and Ian Horner’s research are very promising but it must be remembered that the treatment is not a cure. It just keeps the trees standing in the meantime. The sanitary requirements will continue to be very important. Why is this so important? Because the disease is a species threatening one. No cure has been discovered, nor have any Kauri immune to the disease been identified. These trees are the kings of the forest. Without them not only will the forest lose some of its majesty but the forest’s backbone will disappear. It would be more susceptible to wind damage and weeds will flourish. The second major topical issue is the state of the Manukau Harbour and the West Coast lagoons. A recent article (http://www.nzherald.co.nz/nz/news/article.cfm?c_id=1&objectid=11786380) in the Herald highlighted how bad the water quality throughout Auckland is. Things are that bad that swimming at Laingholm and Wood Bay is now banned. And levels of contamination at nearby Green Bay are off the chart with faecal bacteria count measured on November 16, 2016 being an amazing 173 times the maximum safe level. This is wrong. Our beaches should be swimmable. Work is required to identify the exact cause of the pollution but ancient infrastructure as well as dog waste is implicated. And I was astounded to read that the Mangere treatment plant is also implicated with it being reported that Watercare data showed that the plant reached capacity and some wastewater and stormwater had to “bypass” full treatment after heavy rain on average 20 to 22 times a year since the plant was upgraded. The upgrade occurred only 15 years ago. If it is already not up to scratch this is really concerning. The West Coast lagoons present their own distinct issues. The Piha and Bethells Lagoons suffer from local septic systems that are not up to scratch. The local board set up a fund of $50,000 which allowed individual grants of $5,000 to applicants who are upgrading their antiquated septic systems. The idea is to incentivise the replacement of the old systems. The fund has now been fully subscribed. The Retrofit Your Home scheme has also been altered so that residents can borrow from Council up to $35,000 to upgrade their septic systems. Hopefully once the new systems are in place water quality will improve dramatically. If not then other regulatory approaches will need to be considered. The third event I wish to refer to is the very successful Waitangi Day celebration recently held at Hoani Waititi Marae. The event was a mix of the traditional and the modern with the day started with a traditional Powhiri. Henderson Massey Board member Will Flavell did a great job for us in providing a respectful reply during the speeches and unlike last year Board members were spared the sound of my singing solo! The organisers did a superb job organising the event. Turnout was huge and on a hot fine day everyone enjoyed the music and food that was on display. My personal favourite was the Mussell fritters. Waitangi day has been, at least according to the media, a day of dispute and contention. This certainly is not the case on Hoani Waititi Marae on any Waitangi day that I have attended. The day should be a celebration of our status as a country as well as a day for us to reflect on the injustices meted out to Maori and the forgiveness they have shown for these injustices and the trustees of the Hoani Waititi marae perform this role tremendously. The event also highlighted what I hope is a strengthening relationship between the board and the trustees of the Marae. The members of the Marae achieve great things and a partnership based on respect and shared values I believe will be very helpful for our community.